The Fiorile Financial Advisory Group was created nearly 30 years ago in the Historic Village of Saranac Lake, New York, which is located in the Olympic and High Peaks Region of the Adirondacks, a resort area. Minutes away from Saranac Lake is where the 1932 and 1980 Winter Olympics were held in Lake Placid, NY. Our staff and our tenants all live and work in this resort region of the Adirondacks, with beautiful Saranac Lake having a very rich history in healing and healthy living. Well known for curing tuberculosis in the 1800's and early 1900's, Saranac Lake is famous for its "cure cottages," which attracted patients, physicians, scientists and visitors from around the world. Saranac Lake was (and still is) reputed to have rejuvenating air quality coupled with the aroma of pine and balsam, which was (and still is) thought to have healing qualities. For those seeking solitude, peace and serenity, Saranac Lake is reputed today as the place to stay for self-reflection, inspiration, spiritual connection and inner peace. For this reason, many famous people have lived in Saranac Lake, NY. For example, while living in Saranac Lake, Robert Louis Stevens wrote "Treasure Island." While Mark Twain was living here, Mr. Twain wrote the "Double-Barreled Detective Story." The great Hungarian composer Béla Bartók spent the last summer of his life in Saranac Lake, writing two pieces, his Third Piano Concerto and his Viola Concerto. The cartoonist Garry Trudeau, who draws the Doonesbury comic strip, was raised in Saranac Lake. And, Albert Einstein had a summer cottage here and was frequently seen in his canoe on Lake Flower fishing for his favorite local cuisine, Bullheads! Among several United States Presidents who have frequented Saranac Lake is President Calvin Coolidge and President Bill Clinton. Nicknamed as the "Capital of the Adirondacks," Saranac Lake is ranked 11th in the United States in The 100 Best Small Towns in America. Saranac Lake was also named as an All-America City in 1908, and is named as one of the Dozen Distinctive Destinations by the National Trust for Historic Preservation. In fact, 186 buildings in our village are listed on the National Register of Historic Places. 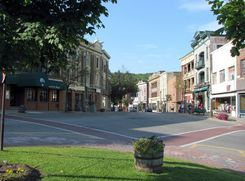 Most recently, National Geographic featured Saranac Lake, NY in its July 2012 publication. The cultural effect of living, working, playing and raising our families in this Adirondack community is evident in our business practices, as well. Rather than treating the symptoms of your organization’s financial challenges, the Fiorile Financial Advisory Group applies a holistic approach. The totality of our organization encompasses four key critical areas that are essential to your financial health. Whether you are a retiree concerned about how long your resources will last, an executive director of a non-profit organization concerned about the potential of losing funding, or a well-seasoned entrepreneur adversely affected by current economic challenges, the Fiorile team handles all components of what it takes to achieve the results you require. Our ensemble of professionals provides a diverse perspective and wide range of solutions to addressing the problem areas of your business or organization, threats to your goals, and obstacles to you attaining your bottom line. From soup-to-nuts, from posting your weekly transactions and payroll to preparing your audited financial statements, all of your financial and business needs are available to you by the Fiorile Financial Advisory Group. "Please feel free to call me at 518-891-3290 for an initial 20-minute telephone consultation to explore how our firm can help you. There is absolutely no charge and no obligation." Finally, we meet with you on a regular basis to assess and adjust, as needed. Regardless of the size of your business, organization or personal portfolio, whether you are local or hundreds of miles away, the Fiorile Financial Advisory Group is committed to finding ways to help you successfully achieve your objectives. That’s our bottom line. All levels of attest services for various types of entities; audits, etc. Mr. Fiorile has combined the various components that the firm has practiced in, and combined with other professionals, formed the Fiorile Financial Advisory Group. The objective is to have a comprehensive entity that can deliver a high-level to many different current and future clients. Helping private individuals, small business owners, professional service providers and non-profit organizations throughout the seven regions of the Adirondacks, the Fiorile Financial Advisory Group provides services in Malone, Plattsburgh, Lake George, Glens Falls, Old Forge, Tupper Lake, Lake Placid, Saranac Lake, Burlington, Vermont, Long Lake, Cranberry Lake, Star Lake, Harrisville, Watertown, Potsdam, Canton, Troy, Syracuse, NY. When the Adirondack Park was created in 1892 by the State of New York - this diverse mountain landscape was a wild place. Full of pristine waterways, boreal forests and the towering Adirondack Mountains. It was land ripe for cultivation or conservation, and it was already on the brink of wide-spread deforestation. Clear cutting was a growing concern for many in the late 1800s, but it wasn't until 1894 that the Adirondack Forest Preserve was established and recognized as a constitutionally protected Forever Wild area. Of the Adirondack Park's 6 million acres, 2.6 million acres are owned by the state. The remaining 3.4 million acres are privately owned. Within the Adirondack Region is the largest publicly protected area in the contiguous United States. It is also home to 105 towns and villages. There is often a misperception that the Adirondack Park is a national or state park, yet the region's mix of public and private land allow for conservation and civilization to thrive. The Adirondack Park was created in 1892 by the State of New York amid concerns for the water and timber resources of the region. Larger than several states in New England, bigger even than Yosemite, Yellowstone, Glacier, Grand Canyon and the Great Smokies National Parks combined - the Adirondack Park contains the largest protected wilderness area east of the Mississippi. Seven distinct geographical regions are located within the Adirondacks: the Adirondack Wild, Lake George Region, Adirondack Coast, Adirondack Lakes Region, Lake Placid Region, Adirondacks-Tughill and the Adirondack Seaway. The Adirondack Park is made up of seven distinct regions - each with their own striking landscape and unique personality. The Adirondack Lakes Region is home to the St. Regis Canoe Area, one of the largest designated wilderness canoe areas in the country. The thriving arts scene in Saranac Lake makes this ‘All American City' a hot spot for year-round entertainment and recreation. Explore the wild coves and waters of the Adirondack Coast. Bring your binoculars and hike the Lake Champlain Birding Trail. Or peddle the Lake Champlain Bikeways, a vast network of scenic road and mountain biking routes. In Plattsburgh, shopping opportunities abound. The Adirondack Seaway's attractions highlight the St. Lawrence River, an idyllic retreat for boaters. Home to Singer Castle and the Eisenhower Lock, the Seaway is also known for its art and cultural centers, majestic waterfalls and Amish culture. Ski, skate, luge and sled in Olympic style in the Lake Placid Region. A historic vacation destination set in the heart of the High Peaks, tee-off at scenic Adirondack golf courses or watch the Sinfonietta perform outside on the shores of Mirror Lake. Schroon Lake offers outstanding fishing opportunities and is the home of a thriving arts community, including the renowned Seagle Music Colony. Whitewater raft down the mighty Hudson River or spend the day boating around the Lake George Region. One of the Adirondack's top family resorts towns, splash away at the Six Flags Great Escape Lodge and Indoor Waterpark, or take a scenic balloon ride over the foothills of the Adirondack Mountains. Enjoy spectacular outdoor ATV riding, biking, camping and hiking in the Adirondack Tughill Plateau - and the annual Cream Cheese Festival in Lowville. Paddle the Black River, taste hand-harvested wines at the Tug Hill Vineyard or visit the American Maple Museum. Discover the Adirondack Wild's historic and artistic attractions. Visit Great Camp Sagamore in Raquette Lake and the Adirondack Museum in Blue Mountain Lake. Peddle miles of scenic road and Adirondack mountain bike routes, or enjoy a night under the stars at one of the many back country camp sites. With a historic downtown shopping district, 19th century "cure cottages," delightful restaurants, art galleries, and a variety of locally owned lodging available, the quiet 'hometown' atmosphere is one of our best features! It's not uncommon to be greeted or served by the actual business owner! The art of life in Saranac Lake is anything but quiet, however! You can spend the day outdoors boating or hiking, visit the world class Wild Center or Adirondack Museum, come back for a fine dinner and then attend an art gallery reception, live theatre performance or concert, or simply sit on a dock, enjoy the sunset and "take the cure" in the Adirondacks! Year round annual events like First Night, Winter Carnival, the Arts & Heritage Festival, Can-Am Rugby Tournament, Plein Air Festival, 90 Miler Classic Canoe Race, and Artist at Work Studio Tour make sure there is always something to do. Nothing tops the outdoor recreation "arts" and adventures available in the Saranac Lake area. Experience wilderness adventures like hiking, climbing, and paddling, or more recreational activities like fishing, boating, biking and birding. 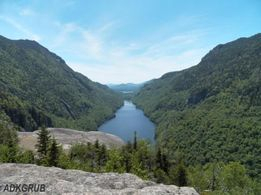 The 46 High Peaks of the Adirondacks await, as well as 100+ lesser peaks. The St. Regis Canoe Area and Northern Forest Canoe Trail make paddler's dreams come true. For casual outdoor recreation there are easy day trips any season of the year. Expert guides and outfitters are also available to assist with trips into the back country. Come visit our Saranac Lake community and experience all the "arts" Saranac Lake has to offer, from the visual, performing and historic arts to the culinary, literary, healing and recreational arts.